How weird has the weather been lately?! An early summer one minute and then a sudden drop back into winter. Apparently it will be picking up again this weekend though! Barbecues are VERY popular in my house and the second there’s even a hint of a sunshine or warmth the coals get lit. A few weeks ago, when the weather was glorious, we took full advantage of the sunshine and had our first barbecue of the year! It’s always a team effort, usually with my Mum and I mixing up some marinades for the meat, salads and side dishes and Dad of course takes up his rightful role of being in charge of the actual barbecue. A last minute decision to barbecue a few Sundays back resulted me pulling some sausages out of the freezer in the morning and then wondering what I could do with the packet of chicken breasts we had in the fridge. I decided to chop them up into pieces and make some kebabs but then what to marinade them in? I was feeling something garlicky/herby but was running low on both when I remembered the tub of homemade pesto I currently have in the fridge… instant garlicky herbiness already prepared! I threw in some chilli flakes for a bit of a kick et voila! 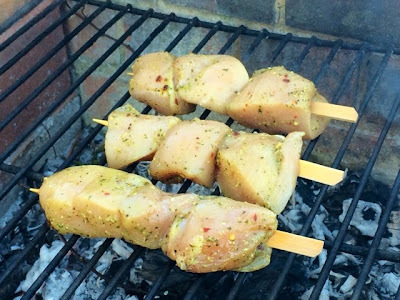 One of the quickest and easiest marinades ever! Ideally you’d mix up your meat in its marinade in the morning or the day before, but if you’ve only got half hour or so to let it sit in the fridge then that’s fine. 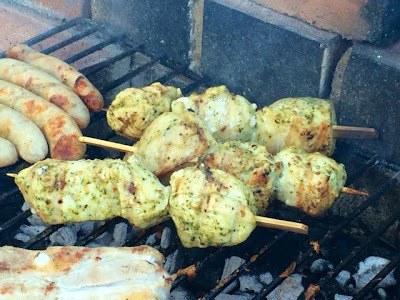 Now with regards to timings… I’m not the most experienced barbecuer in the world so I asked my Dad who seems to have dedicated his life to getting it down to a fine art. I got a mixture of fairly unhelpful responses including ‘Rachael, with a barbecue it’s all about how it feels not about watching the clock‘ and the equally vague ‘About the time it takes me to drink one and a half beers‘. 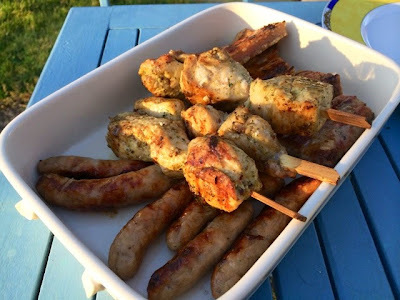 So, I kept an eye on the time while we were doing these on the barbecue and have given you a rough timing but this will depend entirely on how hot your barbecue is etc. 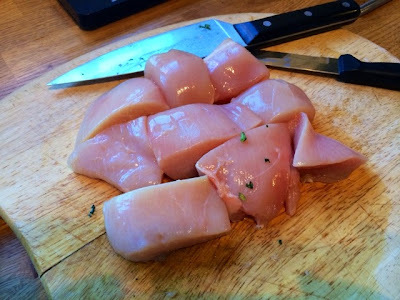 Use my timings as a rough guide and keep an eye on how they’re doing and slice into one of the thickest pieces to check the chicken’s cooked all the way through before you dish it up. Equally feel free to cook these on the grill indoors if it’s chucking it down or the sun’s taken a break which let’s face it is probably quite likely. It’s supposed to be warm again this weekend so fingers crossed! A Mothers’ Day barbecue perhaps? 1. Slice each chicken breast into three pieces. 2. 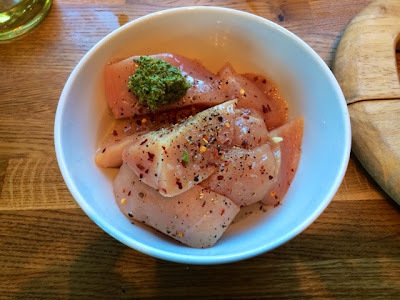 Place the chicken pieces in a bowl and add the olive oil, chilli flakes, pesto and season well with salt and pepper. Cover with cling film and leave to marinate in the fridge for at least an hour. 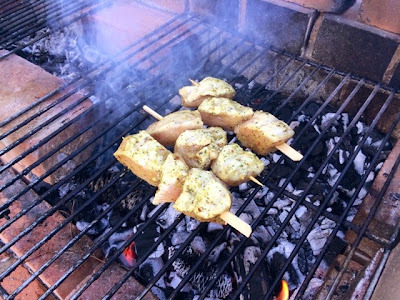 If you’re using wooden kebab sticks, you should also put them in a pint of water to soak now, this will prevent them from burning on the barbecue. 3. 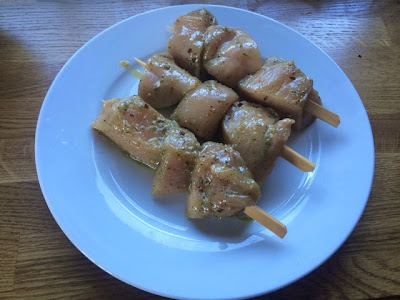 Remove from the fridge and skewer three pieces of chicken onto each stick. Cover and return to the fridge until you’re ready to cook them. 4. 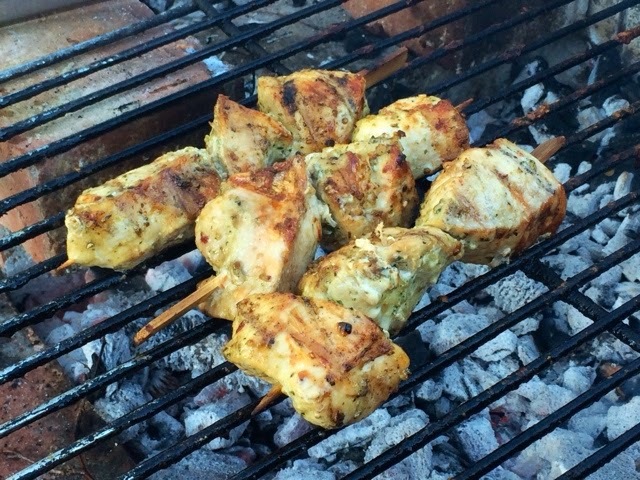 Place on the barbecue and turn repeatedly to ensure even cooking on all sides until cooked all the way through. This should take around 20-25 minutes overall but slice into one of the thickest pieces to check they’re cooked all the way through. Alternatively you can cook these on a griddle or frying pan on the hob following the same instructions or under the grill, again keep turning to ensure even cooking. They should end up a lovely golden brown colour with a few charred bits. 5. Dish up with your sausages, burgers and whatever else you like to have on your barbecue and let everyone get stuck in! 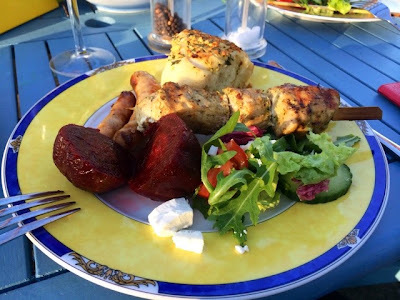 Pesto chicken kebabs served here with a feta salad, beetroot, sausages and homemade garlic bread.